The public bus service in Jávea has long been a figure of fun in the town. During the winter, the service is quite limited and stops running temporarily for siesta which means that quite often those who work similar hours can't use it and opt for the car instead. In addition, the current routes don't service much of the municipality, including the urbanisations on the slopes of the Montgó and those urbanisations to the south, such as Rafalet, Las Laderas and Pinosol. A very limited route used to run up from the old town to the lighthouse on Cabo de la Nao but was withdrawn when the concessions were renewed in 2014. There are no doubt many reasons as to why this area is no longer covered as well as other areas of Jávea but feedback suggests that there is a demand. Still, a limited service is better than no service at all and it is a valuable asset for an increasing number of people. 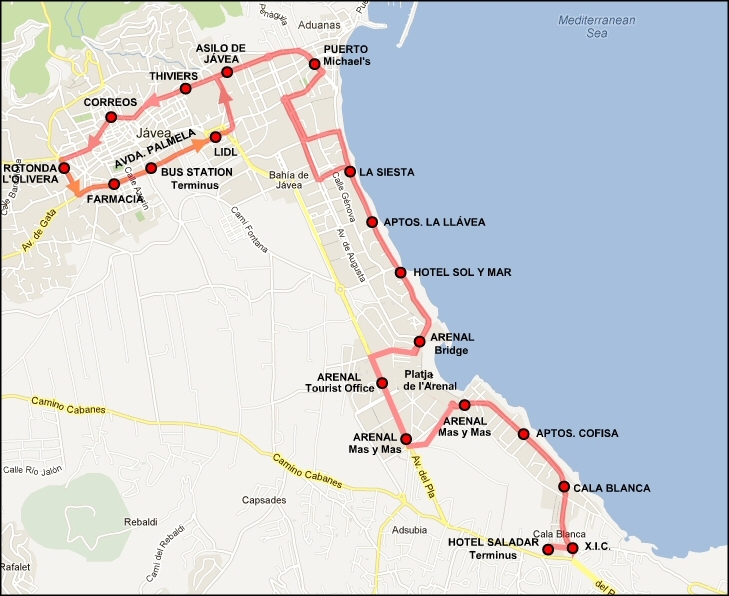 The current contract is run by Grupo DeniBus who provide a single route called TOSCAMARBUS which runs between the old town and the Toscamar urbanisation via the port and the Arenal beach area. HOW TO USE THE BUS: There are a number of bus stops dotted around the municipality (see the maps below), most being a simple green pole with a timetable pasted to it, although more are now being provided with shelter from the sun and, to some extent, the rain. In some places, especially along the coastline between the port and the Arenal, the bus stop exists only on one side of the road (the Arenal direction); to catch the bus in the opposite direction, simply stand opposite the stop and flag down the bus as it approaches. Most of the drivers are quite pleasant but be aware that very few of them - if any - speak enough English to engage in conversation. However there is just one price for whatever distance you are travelling so you don't need to state your destination but simply hand over your money (be aware that the drivers prefer change; some have even refused to take notes, even 5 euros) and then take the ticket from the machine after the driver has printed it. The ticket will often not make much sense, either in time or details about the stop, but keep it with you just in case you need to produce it. When you approach your destination, push one of the buttons located along the length of the bus and then exit using the middle doors. The price is the same, regardless of the length of the journey. This can be requested from the driver who will issue a season card. To qualify for this discount, a pensioner's card issued by the Generalitat Valenciana must be presented to the driver. This can be requested from the social services at the Ayuntamiento de Xàbia. The 21:00 service is run between Apr 1 and Oct 25. The 21:30 service is run between Apr 1 and Oct 25. NOTE: All timings are approximate and based on personal experience over the past few years. They are dependent on traffic conditions and the driver, some of whom fancy themselves as potential team-mates of Fernando Alonso whilst others are in no hurry to reach their destination.